Friday night’s matchup featured two teams fighting desperately for their playoff lives with the Phoenix Suns clinging on for dear life onto their eighth spot, holding only a half a game advantage on the Dallas Mavericks. As for the Knicks, as poorly as they have played, the Atlanta Hawks have played that much worse, and are in a complete downward spiral losing five straight games, as New York climbed a game and a half back of the eighth seed. Goran Dragic exploded out the opening gate, going 7-for-8 from the field, with three of them coming from beyond the arc, finishing the first quarter with 18 points. Phoenix as a team had six threes in the opening quarter, which should come as no surprise since the Suns are third in three-point field goals made with 9.4 made per game, and top five in the league in three-point field goal percentage with 37.6%. J.R. Smith kept New York in the game early in the first quarter, scoring back to back threes, after tying a franchise record the previous game with nine three-pointers made against the Sacramento Kings. Smith scored ten points in the first quarter, but cooled off significantly the rest of the game, going 2-for-7 the rest of the way. New York went cold in the middle of the second quarter, making only one field goal in a span of five minutes, during which, Phoenix went on a 15-2 run, to hold a 53-37 lead with 4:01 left in the second quarter. The Knicks struggled mightily in the second quarter, converting only 31.6% of their attempts from the field, and New York was sub 40% for the first half. The Morris twins, Marcus and Markieff combined for 20 of the Phoenix Suns’s 28 second quarter points. The Suns completely outhustled the Knicks in the first half, showing that they were the desperate team for that last Playoff spot in their respective Conference. Phoenix outran New York on the open court, scoring 15 fast break points in the first half, with the most despicable one coming 3:12 left in the second quarter, where Phoenix got out to a four on one fast break…outhustling the Knicks completely, Eric Bledsoe went behind the back pass to Marcus Morris who laid it in easily for a 55-40 lead. The Suns also outworked the Knicks on the offensive glass, grabbing eight offensive rebounds in the first half for 19 second chance points! Phoenix kept their strangle hold on New York, suffocating the Knicks on defense for the final four minutes, again holding New York without a field goal to end the first half, ending the first half on a 9-0 run to give Phoenix a 62-40 lead at halftime. Goran Dragic received five stitches over his left eye at halftime after taking a shot from Tyson Chandler just before the half, and continued his brilliance, scoring seven more points in the quarter, but what was even more impressive was Dragic played all 12 minutes in the third quarter after receiving the five stiches, showing his toughness. 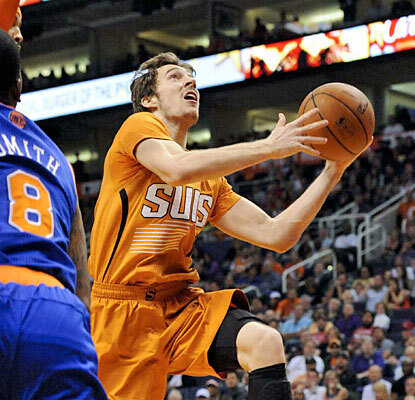 Dragic finished the game with 32 points, scorching the Knicks with five three-pointers. New York couldn’t gain any ground on the Suns in the third quarter, as both teams scored 26 points, matching each other point for point. Phoenix would again hold New York to another long stretch without scoring in the fourth quarter, going on a 12-0 run, to put the nail in the coffin, gaining an 104-75 lead with 6:02 remaining in the game. This run not only put a nail in the coffin to the game, but it could be the nail in the coffin for the New York Knick’s 2013-2014 season, as the 112-88 loss to the Phoenix Suns put New York another half a game back of the Atlanta Hawks.